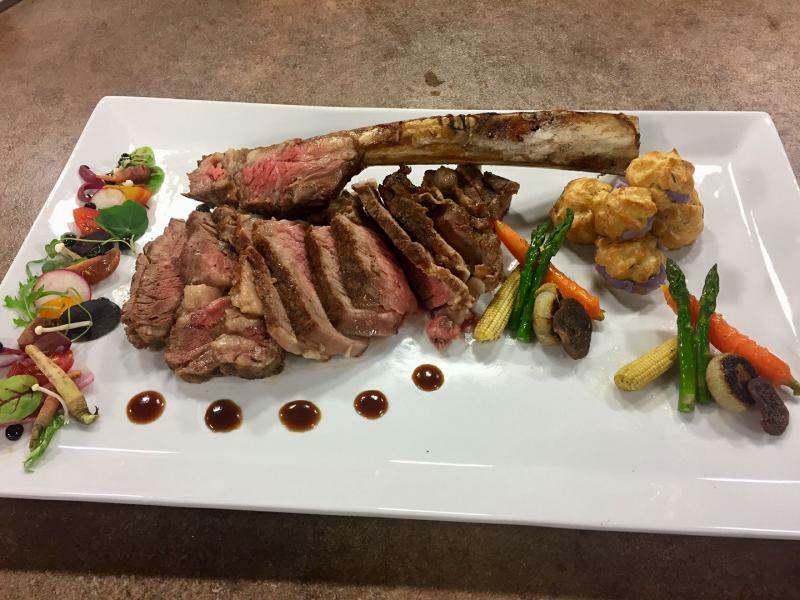 Grilled Tomahawk Rib chop, Purple potato profiteroles, Roasted vegetable melange, veal jus. Season good with kosher salt & fresh cracked blk pepper. Sear of a hot grill, & finish in the oven, cooking to an internal temp of 125* for med rare. Let steak rest for about 10 minutes before slicing. Bring to a boil and slowly add, 1 &1/2 cups flour, reduce heat to medium and cook till mixture forms a heavy dough. It should pull away from the sides of the pot. Cook over low heat for 1-2 minutes, stirring constantly. Remove from heat and let cool down to room temp. When cool, place dough in a mixing bowl for an electric mixer. Crack 7 eggs into a small container making sure there's no shell fragments. Turn mixer on med high setting & slowly add the eggs to the dough, 1 eggs at a time mixing well between each addition. Place the dough in a pastry bag & pipe out onto a parchment or silpat lined sheet pan, making small rosettes. Keep in mind the rosettes will double in size in the oven. Bake at 375*, in a preheated oven for about 30 - 40 minutes. Make sure the profiteroles are completely cooked before taking them out of the oven. Take one out & let it sit in the counter for 2-3 minutes to make sure it doesn' fall. If they fall there's no way to make them rise again. Let cool & then split them in half & fill with your potato mixture. You can use your favorite type of mashed postaotes. Just don't make them too thin, keep them a little heavy so they hold shape. Today I have, Asparagus, Fingerling carrots, Baby corn ears, Mushrooms, chipolini onions. Place the Asparagus, Carrots & Mushroooms on individual roasting trays & season with salt & pepper & a little drizzle of olive oil. Cover the carrots & asparagus with foil & place them all in a 350* oven and roast till they are fork tender, don't over cook. We're going to brown the onions on one side in a little oil, in a saute pan. Turn them over & finish them in the oven. In another saute pan were going to sauted the corn litely in a small amount of butter & finish them in the oven also. When finished place vegetables on a baking screen to drain off the excess oils. Keeping the veg's hot till service.